Athens / Prague / Washington, August 26, 2004 – Prominent Chinese pro-democracy groups and Olympic Watch have joined Tibetan rights supporters in calling for a peaceful protest during the closing ceremony of the Athens Olympics this Sunday, 29 August. 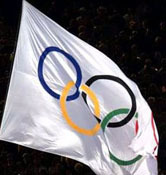 Athletes and spectators are being asked to demonstrate their support for human rights in China and Tibet by remaining silent during China’s presentation and the handover of the Olympic Flag from Athens to Beijing. Olympic Watch, the International Tibet Support Network and the Laogai Research Foundation are among those endorsing the action. This Sunday morning, Olympic Watch will be publishing through its website a set of minimum standards that Beijing should meet in order to be a good host for the next Olympic Games.